For more information, please contact Meaghan Peters at meaghan@bvwhc.org. Nominations are now closed for mentees and applications are still being accepted for mentors until close of business March 1, 2019. "I participated in the AFP mentor program over four years ago and had no idea at the time how helpful it would become. I first heard about the AFP mentor program through a colleague. At that time, I needed guidance on how to strategically make my next career move. I needed to speak with someone who had been in my shoes - someone who has had to leave a job they loved, dealt with a difficult boss, or ask for a raise that was rightfully deserved. These were the questions I needed answers to and, with the guidance of my AFP mentor, I not only found answers but also received invaluable advice on how to think differently, look beyond my next step and how to build long-term strategic career goals." 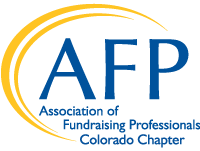 "What a pleasure it was mentoring Kurtis in the AFP Colorado mentor program. As a 'mentee,' Kurtis had a positive attitude, asked great questions, and was willing to jump in and try new things. It was rewarding to be a part of his successes, plus I learned a lot, too! In the process of coaching Kurtis, I improved my abilities to organize information and explain it clearly. Logistically, AFP did a good job of organizing and supporting the mentors."